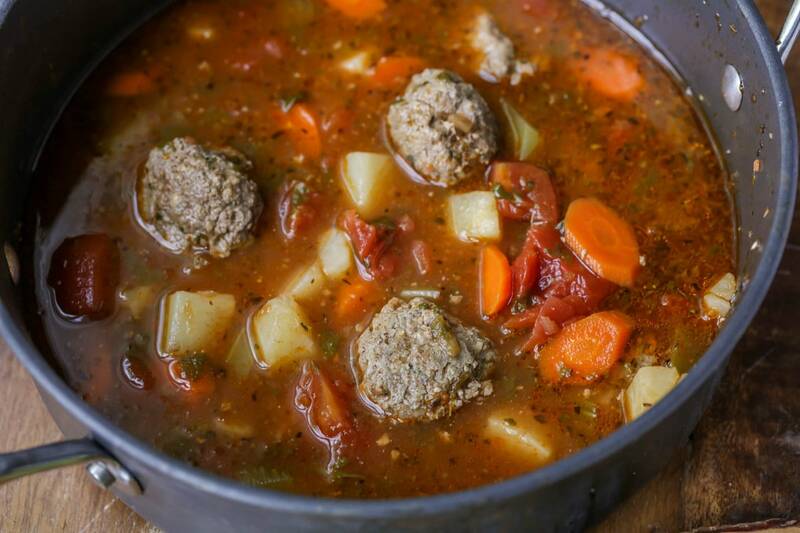 Albondigas soup is a delicious Mexican recipe filled with meatballs, vegetables and spices! 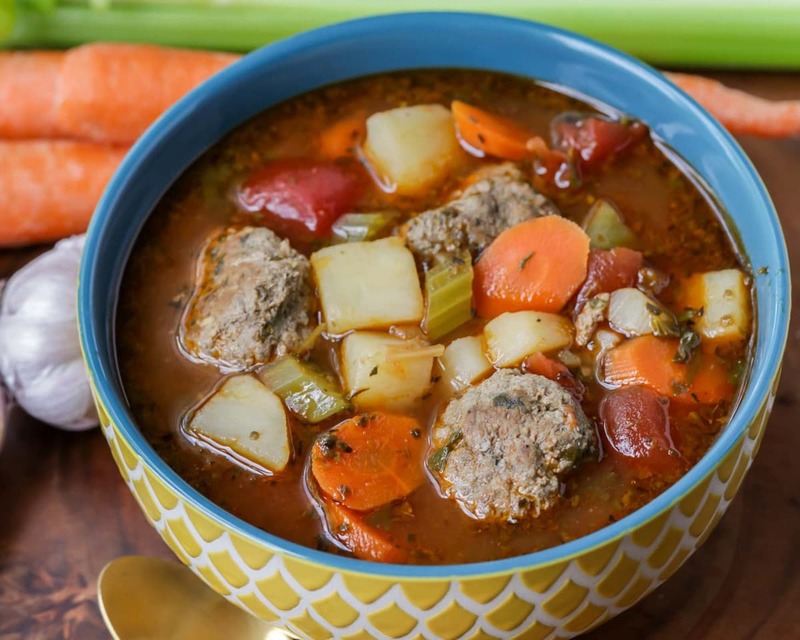 Packed full of flavor, this simple Albondigas soup is sure to become a favorite. 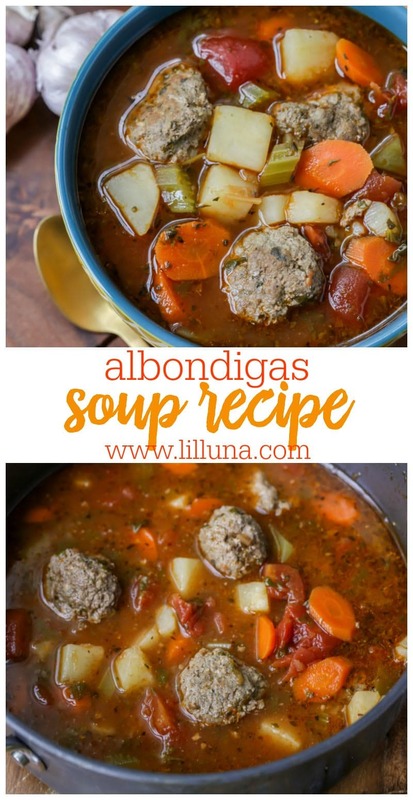 Have you ever heard of or tasted Albondigas soup? 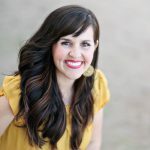 If you haven’t – you’re totally missing out! But, now’s your chance to try it. What is albondigas soup made of? This traditional Mexican soup has a flavorful broth base filled with tomatoes and other veggies and includes homemade meatballs. It occasionally has rice in it too! 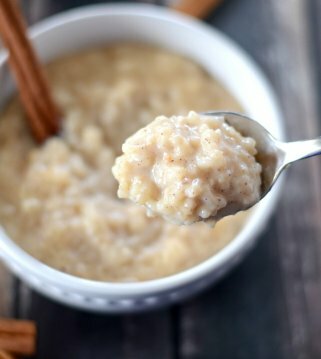 This recipe was recreated based off of the soup my great-grandma would make, and we finally nailed it! It’s flavorful and hearty and just like grandma’s! 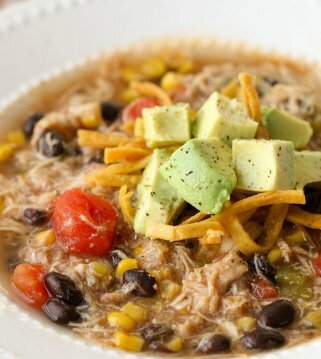 All of the flavors of this soup are SO delicious and simple. After creating the seasoned broth base, you add the meatballs and veggies and simmer until ready – creating an easy and tasty Mexican soup recipe. Make the meatballs by combining these ingredients and rolling between your hands (we made ours about 1 1/2 inches wide). 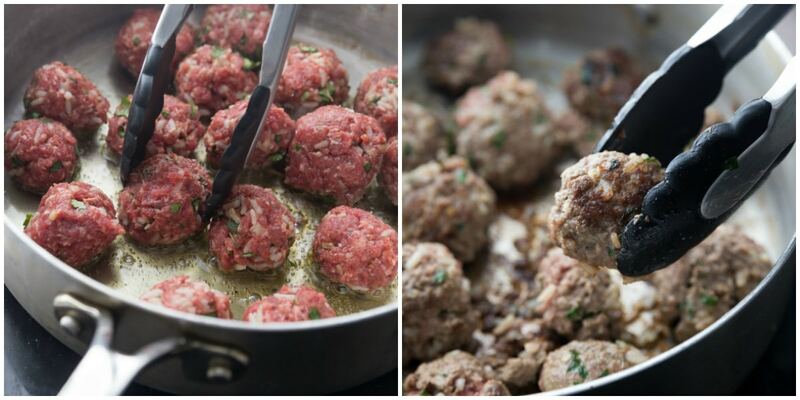 You will be able to make about 20 – 24 meatballs total. Brown each meatball for a few minutes in a hot pan. Make sure all sides are browned. Set the meatballs aside while you prepare the rest of the soup. 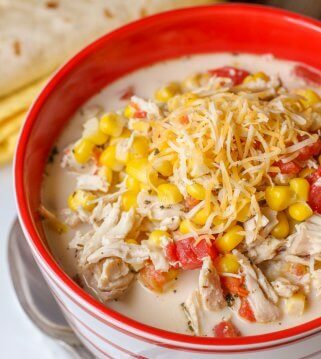 Combine chicken brother, celery, tomatoes, cumin, oregano, and cilantro leaves in a big pot. Bring these ingredients to a boil over high heat. Once it’s boiling, turn the heat down and simmer for about 10 minutes. Add the meatballs and potatoes to the soup mixture. Increase the heat to a boil so that the meatballs can cook a bit. Return to a simmer and cook for an additional 20 minutes. Add a little salt and pepper to your liking and ENJOY it nice and warm. Can you add rice to albondigas soup? You can add rice to the meatballs when making them, or you can add as much as you like to the soup, cooking it for the last 20 minutes of simmering. Let cool and store in an air-tight container in the fridge for 3-4 days or freeze in containers or doubled bagged in freezer bags. To reheat, let thaw in fridge over night and return to the stove and cook until heated through. You can also microwave it as well. 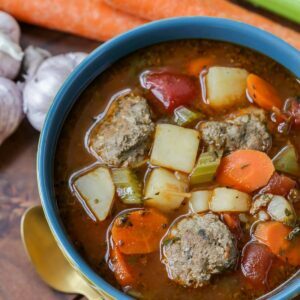 How to make albondigas soup in crock pot? Just add all your ingredients (except for your cilantro) to your slow cooker and cook on LOW for 4 hours. Add cilantro at the very end and salt and pepper if needed. 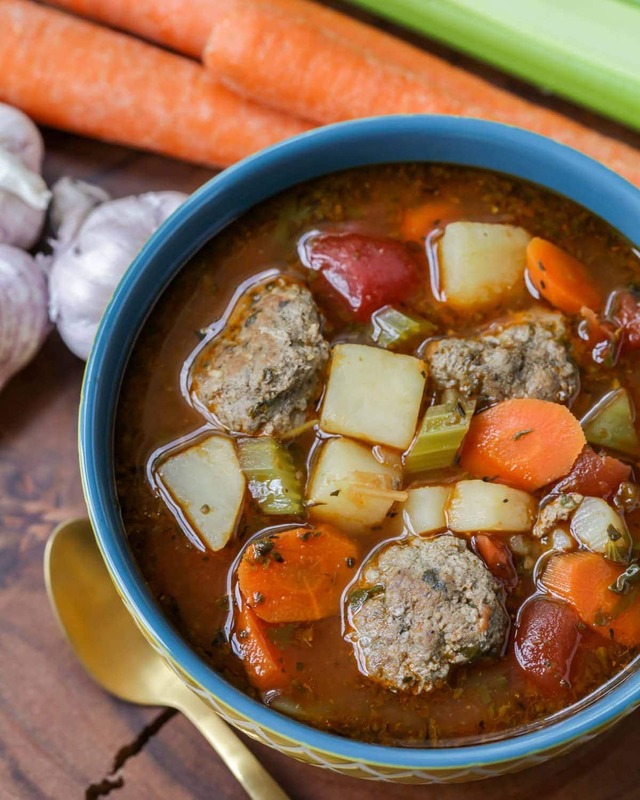 The smell of this Mexican Albondigas soup is soooo yummy and it will fill your entire house. Your family will be begging for second and third helpings! Let us know if you try Grandma’s recipe, and we hope you love it as much as we do. 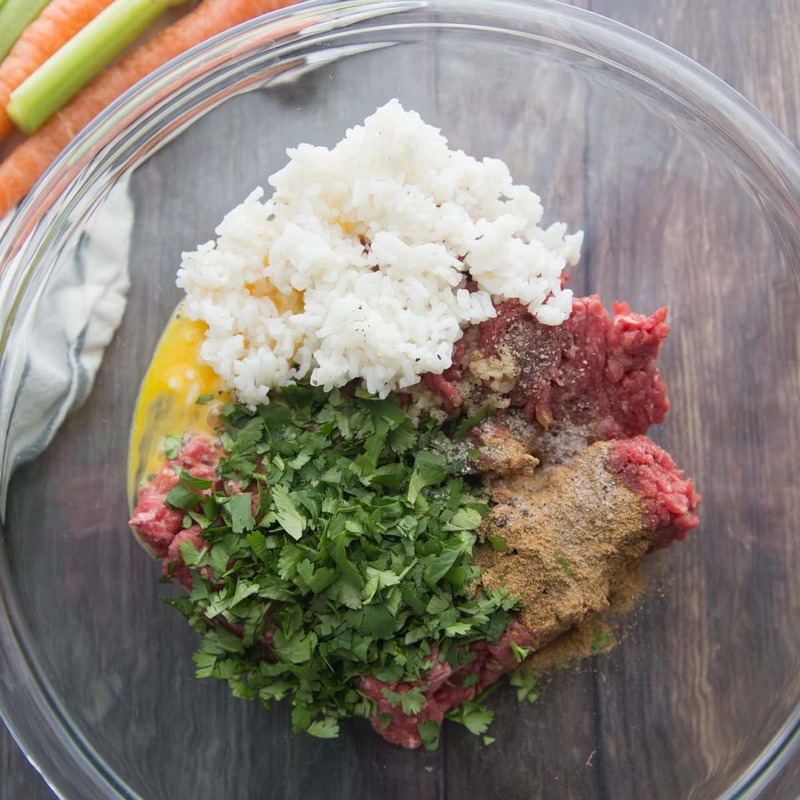 Meatballs: Combine all ingredients together thoroughly. Form 20-24 tight meatballs by rolling between your palms (we made ours about 1 1/2 inch wide). Brown in a hot pan for a few minutes on each. Set aside. 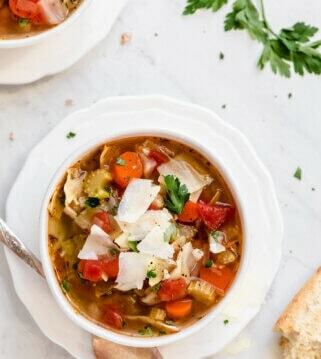 In a large pot, combine chicken broth, carrots, celery, tomatoes, cumin, oregano, and cilantro leaves. Bring to a boil, and reduce heat to a mild simmer for 10 minutes. Drop meatballs and potatoes in the soup and slightly boil so that meatballs cook quickly. Return to simmer and cook another 20 minutes. Salt and Pepper to taste. Enjoy warm. 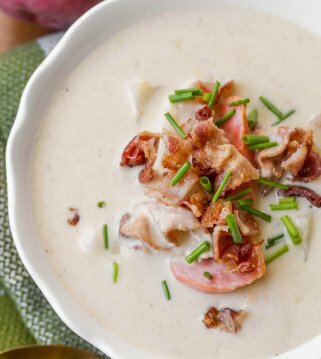 I love this soup recipe, perfect for a rainy Fall evening! I love Albondigas – when my Grandma would take me to Olvera Street as a little kid, it was always my favorite thing to order! I love this recipe so much – tastes just like I used to get there! I am so glad it does 🙂 Thank you so much for sharing that! Yay!! I hope you love it, as much as we do! Thanks! 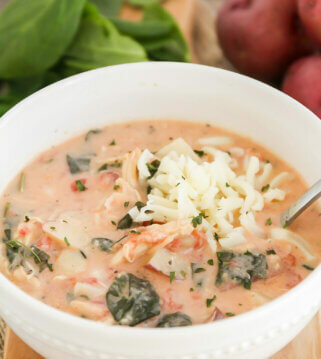 This soup looks perfect for fall and winter! 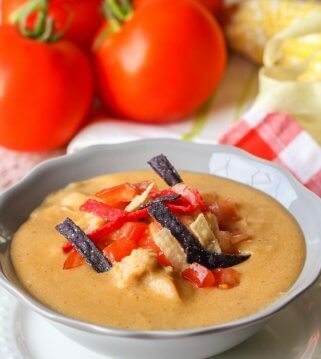 I love hearty soups, especially ones with Mexican flavors. I’ll have to try it out! I’m with ya! They are always so tasty!! Thank you! It really is so tasty! I hope your family does love it, if you give it a try!! Thank you!! everybody loved it! including my toddler. Yay!! Love to hear that 🙂 Thank you for sharing! That sounds perfect! Thank you for sharing that! *Not sure why this won’t let me post not in all caps? I am not yelling…LOL! Sounds delicious!! Thank you so much for sharing that! the best tasting, authentic albondigas recipe i’ve tried! Awe, thank you so much for saying that! This is a good MEATBALL-TOMATOE SOUP; everyone in our home liked it, but it’s not Abondigas. Abondigas doesn’t taste anything like this. I thought a little heavy on cumin overall, but actually really Liked the meatballs. Sounds wonderful! I don’t like the taste of cilantro…can I leave it out and not ruin the taste of soup? You sure could 🙂 I hope you try it!! It is so tasty! Never had Albondigas soup before this- it’s so good! THANK YOU FOR SHARING YOUR RECIPE. This was the first time that I have made this recipe! SO GOOD! This recipe was easy to follow and I doubled ingredients for leftovers. Absolutely delicious, added lemon to soup after serving in bowl. Love love love! Super easy to follow and make this coming from a person that always buRns food and doesnt cook much so you know its super easy to do. I used my crockpot and didnt use rice as i had none. Super DELICIOUS Just like my mom Use to make it! Glad you like it 🙂 Thank you for sharing that! I am glad you tried it!